Using a decanter can take too long. The Empino wine aerator is a NEW approach to aerating wine, that makes wine taste significantly better in just seconds. No matter your experience with wine, you'll notice the difference between a glass aerated with Empino wine decanter and the same wine unaerated immediately. 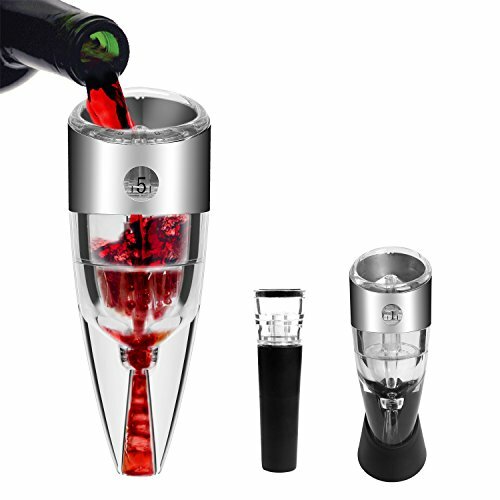 To use, select the aeration speed you wish to have by twisting the stainless steel band to display the desired level from 0-6, then grab your Empino wine aerator and pour your wine through it into your glass. You can hear a slight aeration noise as it goes through the Empino! That's the sound of wine opening up, as it enters your glass, resulting in a superior tasting glass of wine. Why Does the Empino Wine Aerator Perform Better? The Empino utilizes a globally patented three step aeration process, that fully aerates your glass of wine from beginning to end in just seconds. It works 300% faster than a normal decanter. Empino infuses air into wine as it's dispensed, providing the oxygen needed to soften those tannins and other less favorable compounds (like sulfites, sulfides, and ethanol) associated with bold reds, allowing you to better taste the key characteristics of your wine. Empino's portable size and no-mess design makes it perfect to take on the road. Wine picnic at the beach? Sign me up. Your next camping trip? Empino can go there, too. SIGNIFICANTLY IMPROVES ANY WINE WITH JUST ONE POUR - Our Empino Wine Aerator Pourer has a large aerating chamber and air intake system that utilizes the Bernoulli Effect to infuse your wine with the OPTIMAL amount of oxygen. Double the value of your wine by simply pouring yourself a glass! UNIQUE 0-6 SPEED ADJUSTABLE WINE AERATOR - Comes with multi-stage aeration system to enhances the flavor and bouquet, and offers a full control of wine tannins taste with simple twist action 0 - 6 aeration speed adjustment. PERFECT FOR PARTY OR BEING A GIFT - Enjoy a delicious glass of wine at home or different parties; Make every glass of wine taste better; Great fun to use for wine tastings! Made of food grade material with elegant design, which is a perfect gift for families or friends. TIPS - There are two slight fold lines that extend upward from each air hole which are normal. During manufacturing, material folds around rods and wraps back which causes the fold lines. If you have any questions about this product by Empino, contact us by completing and submitting the form below. If you are looking for a specif part number, please include it with your message.